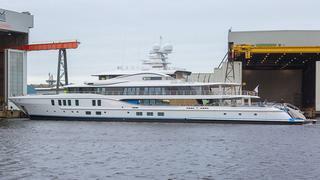 The first yacht in the Amels 242 Limited Editions range, Plvs Vltra has been delivered by Moran Yacht & Ship. 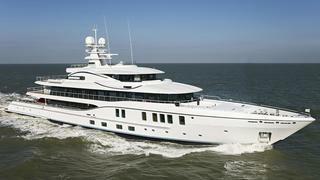 The 74 metre yacht features exterior design by industry stalwart Tim Heywood. Moran Yacht & Ship sold the yacht in 2013 but it wasn't until January 2016 that we were given a rare glimpse of Plvs Vltra as she briefly emerged from the shed in the Dutch shipyard. Plvs Vltra is one of the Amels Limited Editions range, which aims to create a balance between pure custom building and semi-custom, meaning that the yachts can be delivered faster without compromising on quality. Although the systems and technical aspects of the yacht come as standard, owners can choose a designer to help make the interior fit their own style. Plvs Vltra's interior design is by Winch Design and will accommodate 12 guests in six guest cabins, including a large owner's suite on the upper deck and two main deck VIPs. On the main deck aft there is a large infinity pool with tenders stored below on either side. The sun deck features an intimate hot tub surrounded by sunpads, while the bridge deck includes a touch-and-go superyacht helipad. Twin diesel engines will provide a top speed of 16.5 knots and Plvs Vltra will be more than capable of ocean crossings with a 5,000 nautical mile range at 12.5 knots. The new construction team from Moran oversaw the construction process form the start. In a statement, the firm added: "We would like to take this opportunity to thank the team at the Amels Shipyard for their collaboration on another successful project."